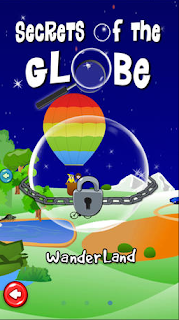 Secrets of the Globe Hidden Objects (Guest Post) ~ Android Forever! Developer Quote: "What secrets are hidden in the Globe? Use your skills to find them in 3 worlds and 30 levels packed with challenge and fun in Secrets of the Globe Hidden Objects!" Puzzle games harness your visual perception, logic and quick thinking! They can be timed or not, but they are always barrels of fun in the challenge they present. One of my favorite types of game genres is hidden objects games. I remember these games with fondness from childhood playing with the family. Not on an electronic device (no such thing in the dinosaur age! ), but using actual items arranged on a tray. In any event, it's so exciting to be able to play on a mobile device or tablet now in bright, high-res color with loads of options and levels! 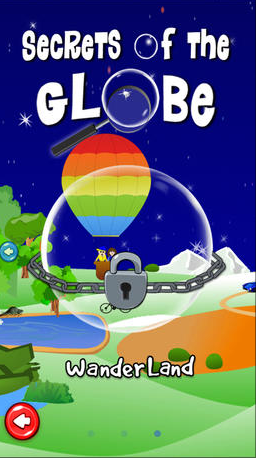 On launching Secrets of the Globe Hidden Objects, you can tap Options if you want to toggle music and sounds on or off. Then tap Play to begin. With 30 different levels set in exciting locations, you will be playing in 3 worlds called Snowville, Green Country and WanderLand. 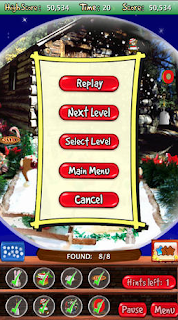 You'll be given your first challenging puzzle set in Snowville. 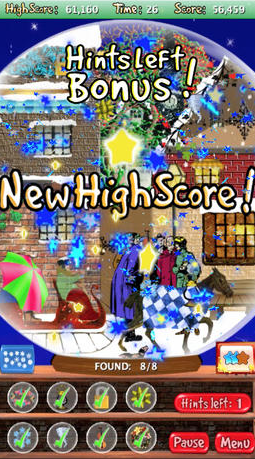 This is a lovely snowy scene complete with snowman in a bubble which begs to be tapped to begin the game! 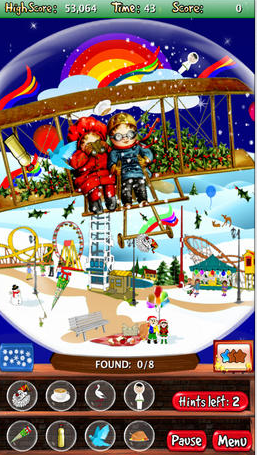 A glass snow globe with a brilliantly colorful scene at a ski resort playground will appear. Under that, you will see items on a bookshelf which must be found in the snow globe scene. Hints are available, but must be used wisely, by tapping the blue stars button to the left. A count of Hints Left is on your display so you will think twice about using them unnecessarily! Get Ready, Set, Go and start hunting quickly as you can for all the hidden objects! As you uncover items (which pop as you tap them), you will see the score change to include your Found items on the wooden base plaque of the snow globe. These same found items, will have a checkmark placed on them where they sit on the bookshelf so you won't try to seek them again. The game is timed with a 45 second countdown, so you must be quick so as not to run out of precious seconds! When you succeed at the game, you will collect a star. The top of the display will show your High Score, Time remaining and Score. See your star collection under the snow globe. The app is for kids of all ages, and big grownup kids too! (Also, what's good to know if you have other devices, is that you can get Secrets of the Globe Hidden Objects from Amazon, Google Play and B & N Nook Store). Every time you replay this game, the objects will be placed in different locations on the screen, so don't get too self assured in thinking you've got it all figured out! Pure fun, challenge, a lot of thought and visual concentration is what you'll need when you play this family game! 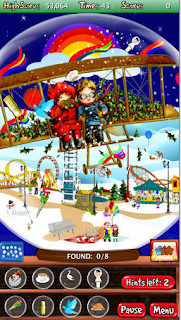 COOL CONCLUSION: Seeking and finding gorgeous graphics of hidden objects cleverly hidden within a scene is what you'll get with Secrets of the Globe Hidden Objects. --Device: Universal: Compatible with iPhone, iPad, and iPod touch. This app is optimized for iPhone 5.